The incredible success of the PHENOL Patchable Analog Synthesizer has created a buzz amongst Eurorack users. After being asked many times whether we would release any parts of PHENOL for Eurorack, we finally created the K6501 PHILTER, inspired by the amazing filters on PHENOL! Offering the fat punchy sound and dirty overdrive when the resonance setting is high, the PHILTER is redesigned to work with Eurorack systems. It offers low-pass, band-pass and high-pass outputs simultaneously. Each output contains a signal indicator showing when that output is active. 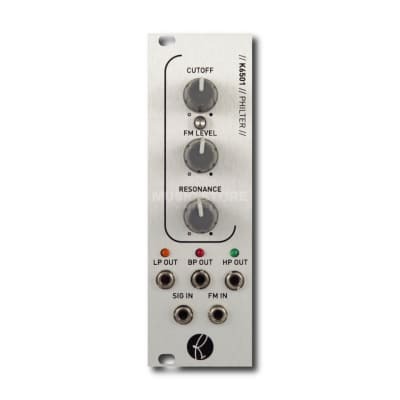 PHILTER has the same tone and range of control as the PHENOL filters in a compact package.